This entry was posted in Favorite Perfumes, Not a Review, Random Stuff and tagged Chamade, Guerlain. Bookmark the permalink. I am not sure which version of Chamade I have – I have a couple in fact – but it is such a cheerful fragrance I should get it out more often. Your zen garden looks very calming, and I think I also recognise the provenance of one of the cats! I think the cat on the picture that seems familiar is a relative of the one that I got from you (but that one is black and white and I’ve already featured it in another setup of this garden – I might publish it or one of the future arrangements one day). I can’t believe that I have never sampled Chamade. How’s that possible…but now I must. 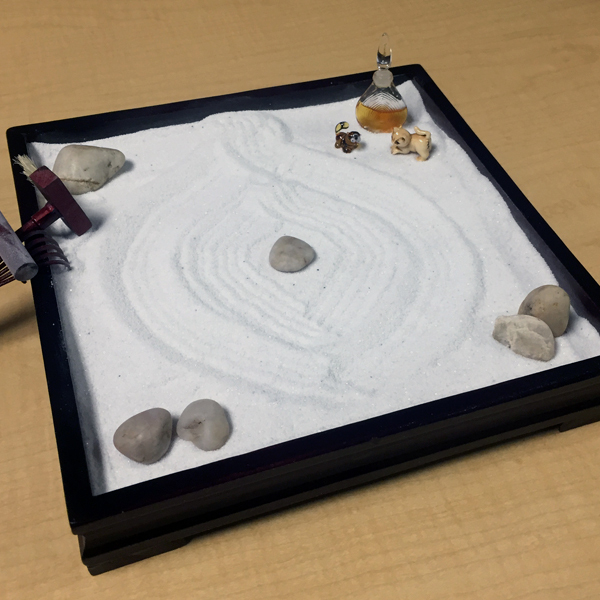 As for your zen garden, I like that for the office…but I can imagine that I would somehow manage to muck things up by spilling all of the sand on my keyboard or some other such nonsense. I think you’ll like Chamade, maybe not to the extend to want to wear it but to appreciate the composition (though, in my opinion, it’s not feminine to the extreme where it requires any courage for a man to wear it). I love that taking a risk with your career inspired you take another much smaller one with this zen garden. It paid off too! I’m sure it will continue to evolve. I wish I had bought the extrait instead of the edp but maybe one day. I didn’t even know the EdP version existed until I read your review. I think it’s not sold in the U.S. I keep playing with the garden and I have at least a couple more ideas. I’ll be probably sharing the results with my readers from time to time. I have never tried Chamade either but i’m sure i will get round to it one day. Just a quick comment on your zen garden. I have worked with a larger version of this in Sandtray therapy, where the therapist invites the client to pick from a myriad of minature figures and place them in the sand. The whole process tells a story and the therapist and client talk about this. It basically helps to bring the unconscious to the surface and make sense of stuff. I’m sure your zen garden has the same calming qualities – don’t be afraid to ‘play’ with it. Ha! I will let you answer your own question…. but it looks like a lot of love going on there. I do like the little pattern that you have drawn in the sand in the middle of the tray! You have now put me in the mood to get my own zen garden ,,,, i look forward to analyzing my own creations soon! You should definitely do your own Zen garden! And then post pictures on your blog (if you decide to start it). Or I can invite you to one of the next posts I do in future when I have more pictures of my garden to share. Just like Houndie – I have never sampled Chamade but basing on the way you write about it, it must be a special perfume that I should try when I get a chance. So nice you could get a vintage mini bottle, even if it starts to be off. Was it a cheap thrill? Love your zen garden. And that bottle is so suitable there. You had a clever idea. I’m less surprised with you not trying it: the combination of your age and availability of this perfume where you live explain this omission. I hope you’ll get a chance to try it. I don’t remember if you like No 19, but if you do, you’ll like this one. Not that they smell alike, but I think of Chamade as of equivalent of No 19 for Guerlain. The mini was cheap: as much as I like the bottle, after paying almost a full price for the regular bottle, I wouldn’t have splurged on a too expensive decorative piece. Ahhhh, one of my besties, Eve, took that shot. It’s looking out the heads at Manly Beach in Sydney. She will be thrilled at such praise Undina. Chamade was my first Guerlain love, at college I used to go and spray Chamade at the department store as I could not affordable to buy it. Don’t like it so much anymore as I used to, I have a bottle of modern extrait which I barely use. Have you tried Jardins de Bagatelle? Love your little Zen Garden. Thank you! It brings me joy, and I’m glad that others liked it as well. I tried Jardins de Bagatelle probably 7-8 years ago and I don’t think I liked it much then though, if I’m not mistaken, I did like it more than Shalimar and Mitsouko, which I tried then for the first time as well. I have some perfumes that I used to love but rarely use nowadays. But I still want to have them and wear from time to time. I absolutely love the bottle design for Chamade but I’ve never tested the juice! I will remedy that the next time I get near a Guerlain counter. 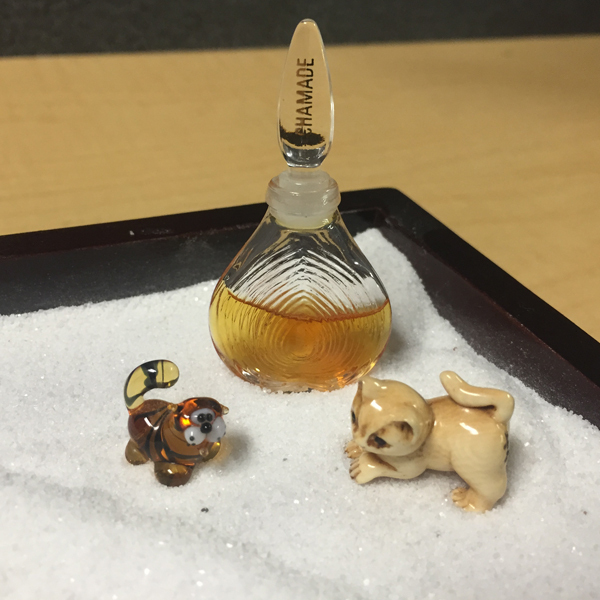 I love your mini bottle and it fits perfectly with your zen garden. I used to have a zen garden in my bedroom when I was growing up. My little brother and sister would always sneak in to play with it – the sand got pretty messy! I’m surprised how many people haven’t tried Chamade. I hope you’ll find it (at least in EdT form) at a Guerlain counter though sometimes you have to ask them since it’s not one of the current favorites. I think I’ve only tried EDT but, yes, I surrender too. :D I love wearing it especially in spring to early summer. I’m glad I have a suitable place in my office to have that garden because I wouldn’t be able to do it at home (I’m sure Rusty would have his own ideas about those arrangements ;) ). Hahaha, I was thinking about what Rusty would do if he found one! It looks like we found our next sand artist! Nice tableau! A decade in your Amazon Wish List!!! I had a zen garden half the size of yours…way before I fell into the rabbit hole. I kept mine in the office and co-workers used it to relieve stress as I did. I left it in the office with a major move. Is yours at home or in the office? If at home, how do you keep Rusty away from it? No Zen at home! Rusty wouldn’t tolerate it, I’m sure. I have the edp which I love for spring and a vintage extrait in a delft canister. Although the bottle is gorgeous, it is actually great because Chamade extrait is notorious for not keeping well, as opposed to nearly all other Guerlains. I have t tried the new extrait but am sure it’s equally wonderful. I love how the pattern in the sand reflects the pattern on the bottle! I also love the idea of a scented zen garden, though maybe that would get to be too much on some days. Hi Undina, I like your kitty inspired zen garden. :) I have never tried Chamade. Will have to put it on my list! Chamade is definitely worth trying. I love the zen garden, the mirroring of the circles in the sand and bottle. And the little animals from collection are perfect. I wonder if you have heard of the jungian therapy that consists of a big sand table with a large selection of miniatures. The seeker chooses the objects and arranges them in the sand, and the guide/therapist talks with them. Often used with children. I had a friend who used this in her practice and I was mesmerized by the tiny room she had with the sand table and a wall of shelves filled with miniatures. I’ve never heard of that type of therapy but I would love to play with something like that! I can see how it can be both therapeutic and revealing. It would be interesting to do an experiment with scents, I agree – just not in the office, I think. Haha – yes maybe scents in the office might be hard to maintain focus… Peace to you! I’m glad you enjoy Chamade too because it was very unexpected for me that so many people hadn’t tried it yet. Extrait has less projection than EdT, I think, so it might be acceptable even among those who prefers light scents.